Size: Required XSmall 6" x 11" x 5" Small 6.5" x 15" x 5" Medium 8" x 18" x 5" Large 10" x 22" x 6" XL 13" x 30" x 6"
This impressive front porch column light pairs nicely with our #129 Banded Sconce. Many clients have put this wall light on their front porch and put the less expensive Banded sconce in other exterior locations. This light fixtures emits a fairly substantial amount of light without glare. Great for up and down lighting as well as some forward and plenty of side lighting with the added bonus of a great front porch column light display. 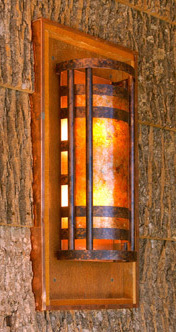 The copper fixtures are typically sealed with an industrial lacquer for lasting beauty. They will not continue to patina unless you choose raw copper or ask us to forego the sealer. All Lightcrafters lighting mounts to any standard junction box in minutes. Having trouble seeing the finish options and/or diffuser options on our website? Check out our expanded finish options page. Shipped within three weeks. Rush orders can generally be accommodated. Does not come with light bulbs. 5 Year Limited Warranty. Use LED bulbs when the light will be utilized for a significantly. Due to the initial cost of the bulb, the financial advantage is diminished when the lamp is used infrequently. Clear and omni-directional bulbs are key to getting interesting patterns thru the sides of the fixtures as shown on our website. LED bulbs often do not play nicely with dimmers. They may flicker and/or not dim as low as incandescent bulbs. Be sure to use the bulb manufacturer’s suggested dimmer. Incandescent bulbs present no issues when it comes to dimming. Have a custom size or design in mind? We specialize in custom orders! Call us at 512-458-5406 or Click Here. Send us an image or a logo or whatever and we will create a wall sconce just for you. These sconces made a world of difference on the large walls of our new building.